How cool is it to have a remote control to turn on and off your lantern from the warmth and comfort of your sleeping bag! The Eureka! 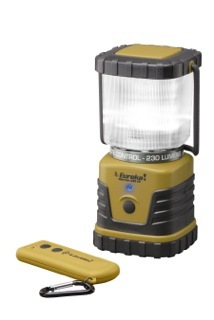 Warrior 230 portable LED lantern offers some of the same performance features as the company’s Warrior 400 Lantern, but includes a remote control that can turn on and off the lantern’s functions from up to 25-feet away. The Warrior 230 has a mini LED and a dimmer switch, as well as a heavy duty carry handle. A flash mode comes in handy as an emergency location beacon and it also comes with a hanging hook. The Warrior 230 measures (3.4″x3.4″x7.3″) and is slighty and is slightly smaller than the Warrior 400 that measures (4.8″ x 4.8″ x 9.5″.). The 230 runs on three D-batteries and has a life of 50 hours on high, 200 hours on low and 200 hours flashing. The Warrior 230 will retail around $64.95. For more information, visit www.Eurekatent.com.